This isn’t an original idea, why get caught up with original when a company has already invested in the R&D to prove the physics of a design? I think I can put an automated design together for low cost and without to much robotics knowledge needed. The basis of the design surrounds the following, proven method of page turning.. My contribution mostly focuses on how to automate the process as easily and cheaply as possible. 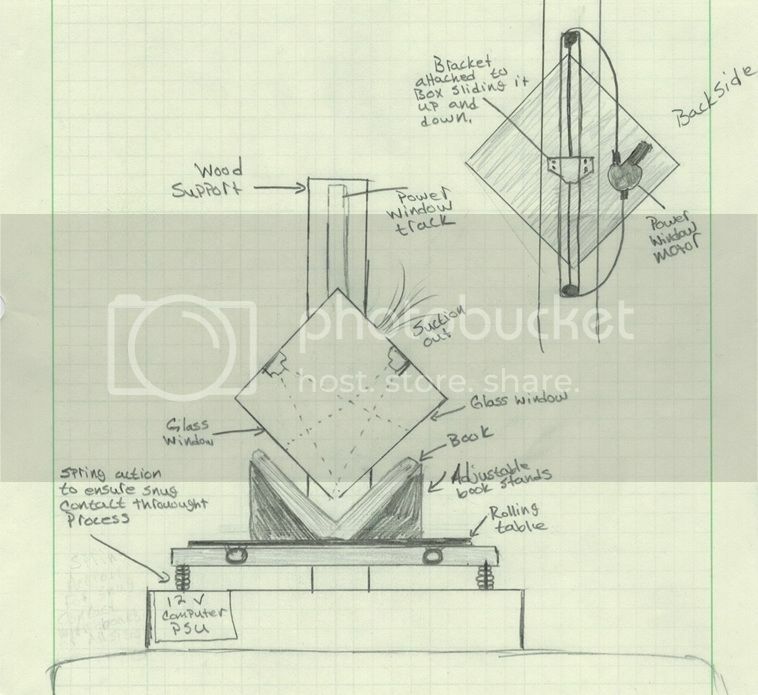 I saw these videos on youtube and the simplicity of the design is intriguing, a single linear movement and air manipulation gets you automated page turning device.. I don’t really know anything about robotics but I think you could make a system like this easily work with just power window motor and a 12V computer power supply along with some servos to actuate the cameras. The design basically consists of a deep platform on the very bottom with room underneath it to house the power supply. The next platform houses the sliding tracks so that the book can move slightly left and right as the machine progresses through the pages. The plat for will be spring loaded so that nothing gets crushed by the motor bringing the window assembly down. This aspect allows you to use a “stupid” hoisting device, with the springs present the motor does not need to be able to sense how much pressure is being applied to the book because the platform has “give” to it. The rolling platform will have adjustable book stands on it to cradle the book. A normal power window assembly out of a vehicle will be hooked up to a timer relay that will simply apply voltage to the motor bringing it down for a specified time, and then reversing the polarity of the motor to bring it back up. The window motor already has built in cut-offs, the motor wont over exert itself or attempt to keep going once it reaches the end of its reach so the timer can be simple. Another reason I chose this type of assembly is because they are inexpensive and move at a rate of speed that would work well for this project. A linear actuator would also work however, the inexpensive ones all seem to move at a really slow pace.. When the actuator is all the way down onto the book you could work it out to where a momentary switch was pressed that sends a voltage to two servos that depress the camera switches. That same old power supply we are using for the power window motor has a 5.5V rail on it too which would be perfect to run a servo off of. When the mechanism rises, the momentary servo switch is releases and the cameras reset. The whole process starts over again via your repeating timer. I liked this design because it only really requires one step of automation, the timer that reverses polarity to the motor. The rest is fairly straight forward and based on a page turning system that has already been proven. As much as I would like to distract myself from grad school to build this thing I just can’t do it right now. I just wanted to share my thought process to maybe give others ideas and explore the idea further so I know more when I am ready to tackle the project.. I would also like to learn more about the type of relay timer that would be needed to actuate the window motor up and down if anyone knows about that kind of stuff here please enlighten me. I like the idea! But it might prove more difficult and complex than it seems. For example once the platen is up the book might not reliably stay in place only through an air stream (think of paperbacks that "flex shut" once you let them go). Additional mechanical fingers could be added to hold the book in place. Another worry is calibrating the suction to always pick only one page. Noise can also be a big drawback with a vacuum system.